Doctor's Best, Collagen Types 1 and 3 with Peptan is a dietary supplement which contains the highest quality pure collagen protein type 1 and 3, produced with the use of enzymatic hydrolysis, enriched with vitamin C.
As a result of collagen hydrolysing, we obtain collagen peptides, compounds of low molecular weight and a unique amino acid profile, which are exceptionally well absorbed by the body system. Vitamin C added to the preparation is essential for the synthesis of collagen, and moreover it determines its proper structure and stability. Such a combination of ingredients results in a unique effectiveness of the product. The supplement brings many benefits for both health and beauty. Collagen hydrolysate contained in it is characterized by high biological activity, and thus it effectively supports the treatment of diseases of bones and joints. Moreover, it improves the appearance and condition of skin, hair and nails. In the study it has been proven that supplementation with collagen hydrolysates not only complements collagen levels in the body system, but also stimulates the organism to the natural production of collagen. Collagen is a fibrillar protein, naturally produced by the body system and present in almost all tissues and organs, that is cartilages, bones, tendons, ligaments and skin. It contains a unique profile of amino acids, among which are: glycine, hydroxylysine, proline and hydroxyproline. In the body system, collagen performs mainly structural functions; it determines the integrity and elasticity of the connective tissue as well as is responsible for its tensile strength. Next to its biomechanical function, collagen is also involved in development of organs, repair of damaged tissues and wound healing process. It interacts well with a variety of receptors which affect the growth, differentiation and adhesion of cells. There are 28 types of collagens, which differ from each other in their structure, occurrence and functions performed in the body system. In supplementation we usually use collagens type I and III, which are the best known and researched collagen proteins. What is more, in clinical trials it has been proven that if collagens type I, II and III are present in the body system in the proper concentration, the body system can produce from them all 28 types of collagens. Collagen type I is the dominant type of collagen in the human body system. It is a fibrous skin support, a major component of bones, tendons and ligaments. It is responsible mainly for tensile strength of tissues and bone stiffness. Collagen type II is mainly a component of dermis, blood vessels and tissues of numerous organs, such as liver, spleen and lungs. In the body system, it is mainly used for quick wound scarring and is also a precursor to collagen type I.
Collagen constitutes 90% of organic bone mass. Collagen protein supplementation has beneficial influence on bone metabolism and mineralisation. Collagen peptides stimulate the activity of osteoblasts, the cells responsible for bone formation. They also support mineral density of bones, and thus they can be an effective measure in the treatment and prevention of osteoporosis. Collagen brings great relief to people suffering from arthritis and osteoarthritis. It contributes to the reduction in swelling, improves joint mobility, reduces feeling of stiffness and relieves pain. Moreover, collagen hydrolysates, after accumulating in the cartilage, stimulate the chondrocytes to natural reconstruction of cartilage. Collagen is essential for keeping your hair, skin and nails in healthy condition. It positively affects the density of skin, improves its firmness and texture as well as reduces the visible signs of ageing. Collagen supplementation helps to reduce dry skin and smoothes wrinkles. Collagen speeds up wound healing and minimizes the risk of inaesthetic scars on damaged skin. Studies have demonstrated that deficiency of collagen type 3 is responsible for differentiation of myofibroblasts and increases the deposition of scar tissue. Collagen improves the quality and strength of hair. It contributes to a faster growth of new hair and determines their proper density. It also strengthens weak, brittle and splitting nails. It rebuilds the nail matrix and stimulates their growth. The natural biosynthesis of collagen in the body system decreases with age. It is estimated that after the age of 25 there occurs a significant imbalance between the production of collagen and its impoverishment in organs and tissues. At the age of 60, the natural collagen synthesis falls as much as 50%. What is more, over time collagen is becoming more and more resistant to dissolution, and its fibres are getting thinner. This results in deteriorating appearance of hair, skin and nails as well as is the main cause of the degenerative changes in bones and joints. Collagen peptides supplementation may slow the age-related adverse changes in the extracellular matrix. Moreover, collagen applied orally, due to the stimulation of chondrocytes, naturally increases the concentration of collagen type II and proteoglycans. Collagen is the perfect supplement for athletes. Intensive trainings mean a big burden for the whole movement apparatus and a greater risk of injury. Collagen hydrolysates not only increase the resistance of joints and tendons, but also accelerate the regeneration processes after injuries. Research carried out with the participation of athletes has demonstrated that regular collagen supplementation significantly improved the mobility and flexibility of their joints. People surveyed observed also a decrease in pain and inflammation which resulted from an overload with too intensive physical activity. 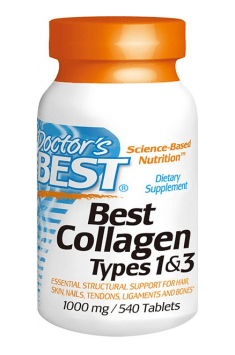 To sum it all up, Doctor's Best Collagen Types 1 and 3 with Peptan is a product aiming at improvement in the functioning of the movement apparatus. It is especially useful in the prevention of diseases related to changes in joint and cartilage tissues. It is recommended for athletes who put their joints, tendons and ligaments at the risk of overload due to intensive trainings and for elderly people suffering from osteoarthritis. An indication for supplementation is also the desire to improve the appearance of skin and to delay the occurrence of unwanted signs of skin ageing, such as wrinkles or loss of firmness. Collagen Types 1 & 3 1000mg 1000mg 540 tab. For tablets: Take 3 tablets twice daily on an empty stomach at least 30 minutes before meals or as recommended by a nutritionally informed physician. Do not mix with other protein supplements. For capsules: Take 4 capsules twice daily on an empty stomach at least 30 minutes before meals or as recommended by a nutritionally informed physician. Do not mix with other protein supplements. Collagen supplementation is recommended not only in case of first pain symptoms, morning stiffness and reduced joint mobility. It is also worth to start the supplementation if we know that our joint are going to be excessively burden, e.g. as a result of intensive preparation for competition. For optimal absorption, collagen should be taken on an empty stomach. It is suggested to take the first recommended dosage when fasting and refrain from eating a meal for at least 30 minutes, and the second one before sleep, at least an hour after the last meal. Preparations containing collagen should never be combined with proteins, including those in the form of high protein ready meals. Proteins impede collagen absorption and prevent some amino acids from being assimilated by the organism. Microcrystalline cellulose, stearic acid, croscarmellose sodium, magnesium stearate (vegetable source), hypermellose (coating).